First United Methodist Church of Osage City is seeking applicants who are committed Christians with a passion for children and youth to fill the position of program coordinator of Children, Youth and Family (CYF). The Coordinator will work to create, develop and maintain ministries that focus on Children, Youth and Families as they relate to our mission to intentionally share God’s love, so people will come to know Christ, and serve as disciples for the healing of the world. This is a part-time, 20 hours per week, salaried position which includes both weekday and weekend responsibilities to encourage and facilitate spiritual growth of children youth and families. Interested applicants are invited to submit a cover letter and resume to the church, attention Gwen Crane, Church Secretary, at [email protected]. 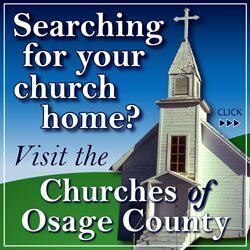 First United Methodist Church of Osage City is seeking applicants who have a spiritual calling as a Choir Director. The Choir Director will work with the pastor and accompanists to select music and lead our choir to inspire worship through music on Sundays, for special occasions and services. The successful candidate will recruit choir members, work with congregants and musicians, and may arrange for musical guests during certain worship services. During summer months (June-August) the director will oversee scheduling and recruitment of special music. This is a part-time position of 4-5 hours a week. Interested applicants are invited to submit a cover letter and resume to the church, attention Gwen Crane, Church Secretary, at [email protected]gecityumc.com. 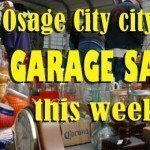 Osage City’s spring citywide garage sales are set for April 19-20, 2019. Sellers can sign up with Tricia Gundy at Peterson Assisted Living, Robyn Williams and staff at Edward Jones, or Kathy Ayers and staff at First National Bank, to get their sale listed on a map distributed by the Osage City Chamber of Commerce. There will be a legend on the map to give buyers an idea of what might be for sale at each location. A $5 donation to be placed on the map goes toward the Chamber’s local scholarship fund. For more information, contact Tricia Gundy at 785-528-3301 or 785-219-9727. 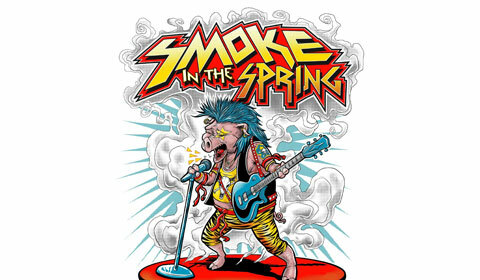 This is a special community event showcasing Smoke in the Spring BBQ teams. BBQ teams accept BBQ Bucks as payment for food. BBQ Bucks can be purchased at either Osage City Hall or Edward Jones starting April 8. BBQ Bucks will be sold on site 1-7 p.m., April 12, at Community Building Concession Stand Windows. BBQ Bucks can be reused, from year to year. BBQ Bucks are a dollar for dollar exchange. The Party Rock and Guitar Chaos of “Chance Encounter” – Bringing 80’s and 90’s hard rock covers! Band members, Devin Chance (guitar & vocals), Johnny Blake (drums), Bob Brown (guitar, keyboard, triangle, & vocals), Jimmy G (bass). Booking information, 785-380-3954 or 785-213-4325. Shuttle Service (Friday only) for those parked at the Osage City School Parking Lot Area (4-9 p.m.), Pick Up at OC Elementary Parking Lot, and drop off will be at Safford, between K-170 and 1st Street. Patrons are also welcome to walk to the event from the Osage City Schools. Designated event handicap parking (handicap spots just west of the OCHS Football Field Bleachers), entry from Highway K-170, sidewalk and asphalt access to the event. Plus, possible shuttle service from event UTVs. Shuttle bus and driver provided by Osage County Senior Center (handicapped accessible). Even though winter seems to never end, Osage City Parks and Recreation is still planning for spring. Sign up deadline for youth baseball and softball is coming April 1; lifeguard applications are being accepted. As host for the Smoke in the Spring State BBQ Championship, April 12-13, 2019, OCPR has been busy signing up cooking teams. OCPR Update: Dance the winter away! Winter is here, but Osage City Parks and Recreation is giving kids a reason to dance – at the OCHS dance clinic. The clinic is for students from pre-K and kindergarten, first and second grade, and third-eighth grade. Practice is 6-8 p.m. January 16 and 17, at the OCHS gym. Dancers will perform during half-time of the OCHS boys varsity game on January 22. Can YOU help? Do you have unneeded equipment taking up space? Did you know that your lightly used durable medical equipment can help a Kansan with disabilities who needs Assistive Technology, but can’t afford it? The ATK-KEE Reuse Program accepts donated equipment that can be refurbished to high quality standards and then given, free of charge, to Kansans with disabilities and health conditions who need them. Standers and gait trainers * Walkers with seats and handbrakes. Time: 8 a.m. -4 p.m.
OCPR Update: Get off the bench and get on the ball! There’s no doubt about which season it is – basketball! It might be cool outside, but Osage City Parks and Recreation is getting ready for basketball players to start warming up the local gyms. Here’s information about OCPR’s upcoming youth basketball season. OCPR teams participate in the Scott Brown Youth Basketball League. League divisions are split into single grades 3rd to 6th grade for boys and girls. Team practice can begin the week of Nov. 26, if a team has a coach. SBBL Season, Saturdays, Jan. 5-Feb. 16. SBBL League Divisional Tournaments, Feb. 23. Players receive a team uniform (jersey and shorts). Cost is $30 per player. OCPR coach-player discount is available. OCPR scholarship forms are available. OCPR Basketball, K-Ball and 1st/2nd grade information will be available soon. Osage City Parks and Recreation has scheduled a new musical program for three to six-year-olds, and tae kwon do classes are gearing up for the fall session. In addition, youth tackle games have been scheduled for the evening of Sept. 19 at the OCHS football field. Details below. John and Leita Hill have fond memories of enjoying meals at local diners. Now they’re hoping to share that happy, old time experience with their customers at Hill’s Drive-Up Diner, located at 1106 N. Topeka Ave., Lyndon, Kan.
“Serving diner food the way we remember it,” is John and Leita’s motto for their mobile “drive up” diner. On the menu, of course, are hamburgers and cheeseburgers, along with their own specially prepared fresh cut fries, pulled pork sandwiches and brats, and fried cheesecake or ice cream treats for dessert. Also planned is a unique daily special every day in addition to the regular menu items. Some specials you might find there include stuffed peppers, fajitas, burritos, kabobs, baked potatoes, and Sloppy Joes. Follow Hill’s Drive-up Diner on Facebook to see which daily specials they are offering. For more information, contact Leita at 785-219-9307, [email protected] or visit hills-drive-up-diner.business.site/. 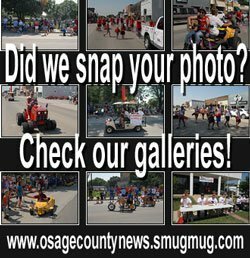 It is that time of the year again to sign up for the fall Osage City citywide garage sale. This is a great opportunity to get rid of some of that stuff you never use and free up some space. The citywide garage sale is set for Sept. 14 and 15, 2018. To sign up, stop by Peterson’s Assisted Living (Tricia Gundy), the Bank of Osage City (Kaitlin Swindale), or the First National Bank (Kathy Ayers). We need your name – as you want it listed on the map, address, a phone number in case of questions about the sale, if you are having the sale Friday and Saturday or Saturday only, what area you are on the map, and a $5 donation fee. The proceeds go towards a scholarship awarded every year to an Osage City High School graduate that is going to college. This year’s scholarships were awarded to two seniors- Carter Swindale and Georgia Hutton. The deadline for adding a sale to the garage sale map is Sept. 10 at 5 p.m.
For more information, call Tricia Gundy, chairperson, Osage City Chamber Garage Sale Committee, at 785-528-3301. Important: Please list your address on the map, $5 donation goes to the Chamber of Commerce High School Scholarship. Don’t forget the deadline to sign up is Sept. 10 at 5 p.m.
OCPR Update: Who’s ready for youth football? Osage City Parks and Recreation is switching gears and lining up late summer and early fall activities, including youth volleyball, tae kwon do, and has scheduled upcoming youth tackle football games. Who’s ready for football? Summer is running out and school is starting up, so Osage City Parks and Recreation is getting ready for fall activities. The signup deadline is here for youth soccer, youth flag football and OCHS cheer camp. The Osage City Aquatic Center remains open until Labor Day. Summer’s not over yet but the Osage City Aquatic Center is open until Labor Day, which is just around the corner. Osage City Parks and Recreation is also gearing up for fall sports, with signup dates announced for youth soccer and youth football. We’ve seen it all before. The past few years, dark money special interest groups have brought negative campaigning to our community. Their tactics are the same again this year. My opponent – and the special interests backing her – waited until the last minute to launch a smear campaign against me. Why? Because by waiting, they hope I won’t have time to respond to their attacks and give you the truth. My campaign is supported by people in our community, businesses, ag groups and health care organizations. When my opponent says I am funded by “lobbyists,” she’s talking about Kansas Farm Bureau, Kansas Livestock Association, Kansas Hospitals and other community groups that represent our families, our values and our jobs. The people backing my campaign are fully disclosed on campaign finance reports, meanwhile the special interest groups that like to throw mud in these campaigns get to hide in the shadows. They don’t live here, work here or raise their families here like you and I do. I voted to fund our schools without a tax increase. That’s a fact. The legislature passed Senate Bill 423 this year, a plan to fund our schools within the existing budget and get the Supreme Court out of our classrooms. There were special interest groups pushing for a $1 billion plan, which would have required a tax hike. I opposed that plan – and I opposed any plan that would have required a tax increase – from the very beginning. My opponent isn’t telling you the truth. I voted to override Brownback and put a stop to his tax favors. My opponent took a special favor appointment from Brownback, so it’s not a surprise that she would support his tax favors too. I don’t think it’s fair that certain corporations get to skirt their taxes while our families and businesses pick up their tab. That’s why I voted to override Brownback. What my opponent fails to mention is that overriding Brownback meant reinstating the ability for our farmers to write off loss carryover, for our families to deduct medical expenses when facing a catastrophic illness or injury, and for homeowners in our community to deduct their property taxes and mortgage interest. Don’t be fooled by her rhetoric. I am pro-life with the voting record to prove it. I have voted for every pro-life bill that has come before the Legislature, including banning dismemberment abortions, defunding Planned Parenthood, and establishing that life begins at conception. I have never wavered on this issue and I never will. My opponent knows that. What she and the special interests backing her take issue with is the fact that I voted for a provision that would not give your doctor permission to lie to you. I don’t think it’s right to give anyone free license to lie. Ah, the primary season is upon us. Robocalls, survey calls, mailers, and print ads. It’s all “part of the game” we play to elect officials to various offices. I am sure many people tune out the bombardment of information thrown at us, but it would serve us well if we stopped and did some checking on the candidates in various races. In the race for State Representative, District 59, which pits the incumbent Blaine Finch against me, Shari Weber, the Finch ads and mailers state, “I answer to you not the lobbyists that keep trying to call the shots for our families.” His 2017 Campaign Finance Report, filed with the Kansas Secretary of State and Ethics Commission, may leave you scratching your head regarding his statement. He has a campaign war chest totaling over $65,000, quite a large amount for a three-term representative. Where did the funds come from? In 2017 he reported contributions totaling $13,225 from 45 entities. ONE contribution of $250.00 came from a resident of the 59th District, the remainder from “lobbyists.” Finch’s July 30, 2018 Campaign Fund report touts another $20,000 plus in campaign contributions; again, mostly from special interests and lobbyists. The reports can be accessed online at the Kansas Governmental Ethics Commission website under the “Campaign Finance heading” and the subhead “View Submitted Forms & Reports.” Here is the link. Also, see here for more information. Finch also states he “funded schools without raising taxes,” yet he voted for the largest tax increase in the history of the state and also retroactively raised taxes on the residents of the 59th District. Instead of enacting legislation to curb spending, he left us all on the hook for increased taxes. Have you felt it? I decided to become involved in Kansas government because I care about the quality of life our children inherit. The strength of communities, agriculture, small business, public education and public safety must be addressed by state government. I am an advocate for children, born and unborn. I stand up for the right to bear arms and I resist tax increases which threaten fiscal responsibility. As a staunch conservative, I align with the values of the 59th District. I know the truth and how to tell it. For too long we have been told one thing when something else is actually happening in our state government. I have a clear legislative record of putting people first, standing strong on principle, and working to make sure government is smart, lean and responsive to the real needs of its citizens. I ask for your vote and trust to serve the 59th House District. 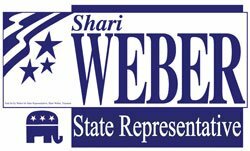 Political ad paid for by Shari Weber. Many have heard about the closing of longtime Osage City business, Peterson Health Care, Inc., which has been a central fixture in Osage City since 1976. Maybe not as well understood, though, is that one family’s legacy of caring for people will continue just across the street at Peterson Assisted Living. Crystal Peterson owns both businesses, with Peterson Health Care offering nursing home services since 1976, and a sister business, Peterson Assisted Living, beginning in 1996. The recent sale of the nursing home was part of Peterson’s plan for retirement. She explained the sale of the nursing home was the first step for reducing her business involvements, but retirement plans still include continuing her family’s business of caring for people. Peterson noted she first began in the nursing home business when she was a child. Her grandparents offered rooms in their home, caring for the elderly and infirm, starting in the 1950s. “It started as a little house with four rooms for the people my grandparents took in,” she said. As Peterson grew up, it was common for her to spend time reading with residents at her grandparents’ home or cranking the player piano for their daily entertainment. “It was part of my life, going there every day after school,” she remembered. As an adult, Peterson continued that tradition of caring, eventually operating the nursing center and neighboring assisted living facility in the 600 block of Holliday Street. With the assisted living facility continuing, Peterson said the business will continue to provide the best experience for residents. Peterson noted that a dedicated staff is in place at the facility, with Tricia Gundy serving as director. Gundy previously served as rehabilitation director at Peterson Health Care. The staff at 20-apartment facility provides the best homelike atmosphere as possible. As an assisted living facility, such things as medication management and meal preparation are included in the cost of living there. While the level of care is different than a nursing home, residents at the assisted living also have access to outside agency assistance, such as for speech therapy or other rehabilitation therapies.